HIPPOCRATES (ca. 460 B.C.-ca. 368 B.C.). Aphorismorum Hippocratis sectiones septem. Lyons: Apud Seb. Gryphium, 1543. The John Martin Rare Book Room holds 21 titles by Hippocrates published from 1527 through the 1800’s. This volume, translated from the Greek to Latin is by François Rabelais (ca. 1490-1553?). Rabelais was a French physician, Catholic monk, and noted humanist, best known for his series —Pantagruel and Gargantua –the comic and satirical masterpieces directed against the superstitions and pretenses of his day. He entered Montpellier to study medicine late in 1530 and by 1532 was physician to the Hôtel Dieu in Lyons. 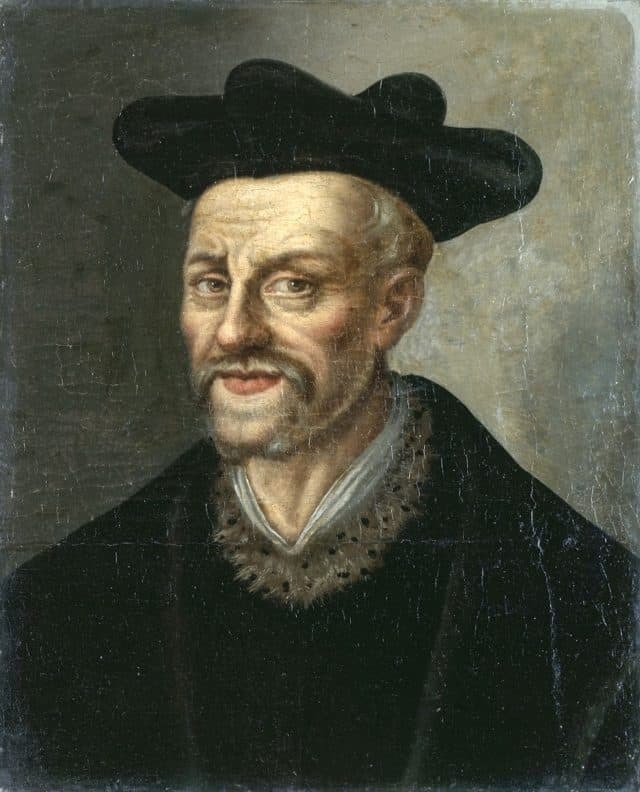 Rabelais compiled and edited the first edition of the present work while at Lyons in 1532. He was one of the first to lecture from Greek texts and, in the book’s dedicatory letter to his good friend Geoffroy d’Estissac, Bishop of Maillezais, indicates that the translation was made from his own ancient text because existing Latin translations were filled with errors. The Greek text of the Aphorismi with its own special title page is added at the end of the book. 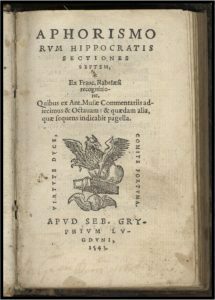 The book also includes Hippocrates’ De medico, medicine officio liber, Liber de lege, and Liber de specie, acie, visuve, & opsios oculorum corrupta.